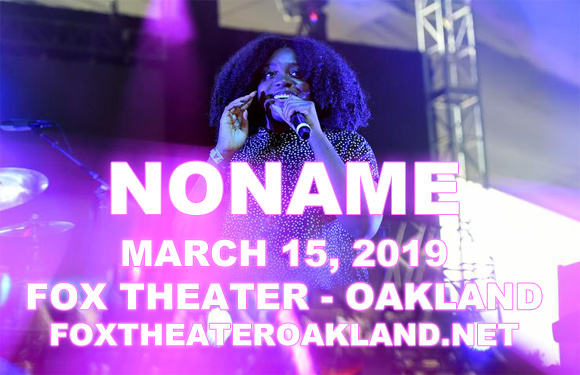 One of the most innovative new faces in hip hop, Chicago-based rapper Noname comes to Fox Theater Oakland on Friday 15th March 2019 to support her smash hit new album Room 25! The critically lauded rapper has delighted fans and reviewers alike with her sensational new material, and continues to prove herself as one of rap music's hottest talents! Touted by critics as both an "artist you need to know" and even "one of the best rappers alive", Noname is truly making waves in the music scene! Don't miss your chance to see this rising star live! Chicago-based poet and rapper Noname began her career in and around the Chicago area in 2010, taking part in local open mics and slam poetry competitions and befriending fellow musicians on the local music scene, including Chance the Rapper, Saba, Mick Jenkins, and Ramaj Eroc. Three years later, she was featured on Chance the Rapper's second mixtape, Acid Rap, and again on his 2016 mixtape Coloring Book. She also collaborated with Chicago-based hip hop artist Mick Jenkins on his 2014 mixtape The Water[s] and she featured on several tracks on Bronx rapper Kirk Knight's album Late Knight Special in 2015. Noname's made her solo debut in 2016 with the mixtape Telefone, which was critically acclaimed and received positive reviews from the likes of Rolling Stone, Stereogum and Consequence of Sound. Her debut full-length album, Room 25, was released in September 2018 to universal acclaim.